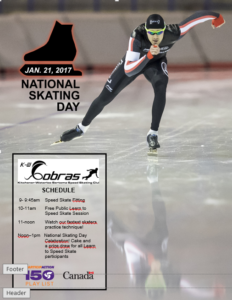 The KW Sertoma Speed Skating Club, in partnership with Speed Skate Canada and ParticipACTION’s 150 Play List, are hosting a FREE Learn to Speed Skate session on Saturday, January 21st from 10-11am at RIM Park Lion’s Arena in Waterloo Ontario! This free session is in celebration of National Skating Day. There will be lots of on-ice fun, cake and a prize draw to celebrate our amazing sport. If you’ve ever wanted to try a fast, fun, and friendly sport, come on out and skate with us for an hour! See the poster below for details on this amazing event! Email info@kwspeedskating.com for more information.